Boy, oh boy, is chilly out there! It’s been awhile since Seattle experienced a cold snap quite like the one we’re currently in! As a full service plumbing, sewer & rooter service provider, at Bob Oates we can only think of one thing when the weather gets this frigid; FREEZING PIPES. Not only are freezing pipes an immediate inconvenience, since you can’t use the water, they also often lead to extremely costly repairs. Remember what happens to water when it freezes? That’s right, it expands, and in a frozen pipe ice can expand past the volume the pipe will allow. If that happens, BAM, your pipe bursts and the repair costs just start to pile up from there. Nobody wants freezing pipes, but luckily there are a ton of steps you can take, not only to prevent your pipes from freezing, but to safely thaw them out if they do freeze. If you’re currently in the throws of the Seattle cold snap, the time for these next few tips may have already come and gone. Still, if you can take any of these preventative measures towards preventing frozen pipes, you should definitely do so. Sure, you’re probably not able to rethink or rearrange the plumbing infrastructure in your home as it stands, but if you can, keep plumbing and pipes away from outside walls where they’ll likely be exposed to cold in winter weather. If you can’t, just knowing which pipes in particular are overly exposed will help you keep an eye on them and take the following preventative measure. If your pipes are near the outside walls, you should insulate them in either both rubber or fiberglass tube insulation. Insulate any pipes that are located in unheated areas of your home, even if it’s not close to the outer walls. Crawl spaces, basements, attics, and the garage should all be insulated as well. Before winter really sets in, make sure to close the shut-off valve for water to outside spigots. Then drain each line by opening the spigot and letting it run until it no longer drips, then close it up. Keep garage and outside doors closed at all times unless absolutely necessary. Also, make sure you deal with any drafts. Open your faucets and run both hot and cold water at just a drip or a trickle. This will help to keep water moving and prevent it from icing up. Keep your indoor thermostat at at least 60ºF. If you’re able to, keep it even warmer, especially if your home and your pipes are lacking insulation. Open cabinets under the kitchen and bathroom sinks to allow warmer air to circulate around the pipes. Preventative and active measures will certainly help you mitigate the risk of freezing pipes, but there are times where the cold still wins out. 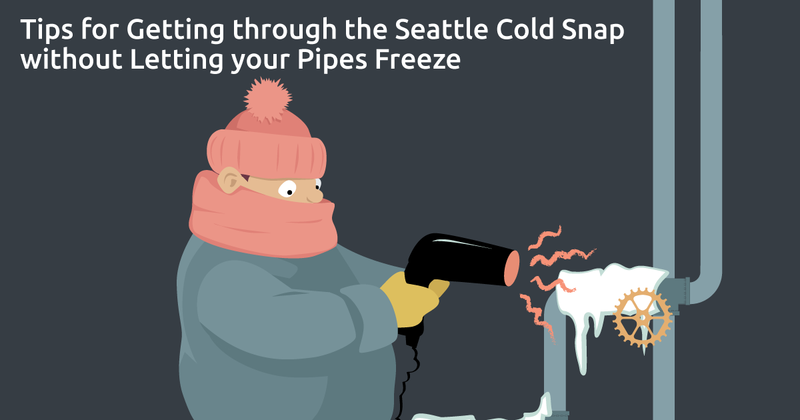 At Bob Oates plumbing, we’ve received a ton of calls about pipes freezing during the current Seattle cold snap. If our pipes are frozen, you should know that there are a few steps you can take to safely thaw them yourself, but you should also know that if you can’t successfully thaw them, the professionals at Bob Oates are here to help. Keep the faucet open. As the ice within the pipe begins to melt, water will flow which will further help the ice melt. Heat up the frozen pipe with an electric heating pad, a blow dryer, a hot water bottle, or towels soaked in hot water. If you have a portable space heater, set it up in the frozen area to warm the air around the pipe. But be careful – don’t ever leave the the space heater unattended. Keep applying heat and running the faucet until full water pressure is returned. If you can’t find the affected area of your pipes, or you’re unable to thaw them, call a licensed plumber, like Bob Oates plumbing sewer & rooter. We’ve handled countless frozen plumbing systems. NEVER, EVER use a blowtorch, kerosene, or any other open flame. Preventing and dealing with freezing pipes certainly isn’t rocket science. Still, so many seem to avoid taking these incredibly simple steps. At Bob Oates, we’ve heard all the reasons. People often say, “Well, we didn’t want to leave our faucets trickling because of our Water bill,” or, “We didn’t want to shut off the outside spigot because we need that water”. Believe me, whatever cost or inconvenience you could incur from taking these two steps is absolutely nothing compared with what you’ll be dealing with if and when your pipes burst. Do yourself a favor and take the aforementioned steps towards preventing and dealing with freezing pipes. You’ll be happy you did.